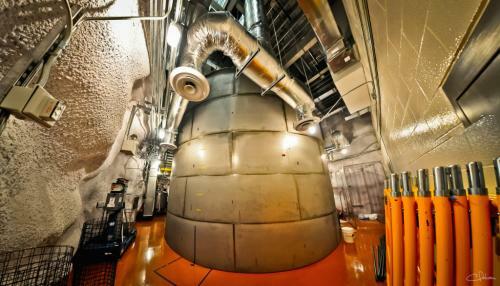 The LZ water shield, currently housing the LUX experiment. (Phys.org) —Last week, the U.S. Department of Energy's Office of Science and the National Science Foundation announced support for a suite of upcoming experiments to search for dark matter that will be many times more sensitive than those currently deployed. These so-called Generation 2 Dark Matter Experiments include the LUX-Zeplin (LZ) experiment, an international collaboration formed in 2012, managed by DOE's Lawrence Berkeley National Lab (Berkeley Lab) and to be located at the Sanford Underground Research Facility (SURF) in South Dakota. With the announcement, the DOE and NSF officially endorsed LZ and two other dark matter experiments. "The great news is we've been given the go-ahead," says William Edwards, LZ project manager and engineer in Berkeley Lab Physics Division. "We're looking forward to making what has been a proposal into a real, operational, first-rate experiment." The LZ experiment was first proposed two years ago to search for and advance our understanding of dark matter, a mysterious substance that makes up roughly 27 percent of the universe. The experiment will build on the current dark matter experiment at SURF called the Large Underground Xenon detector, or LUX. Dark matter, so named because it doesn't emit or absorb light, leaves clues about its presence via gravity: it affects the orbital velocities of galaxies in clusters and distorts light emitted from background objects in a phenomenon known as gravitational lensing. But direct detection of dark matter has so far been elusive. 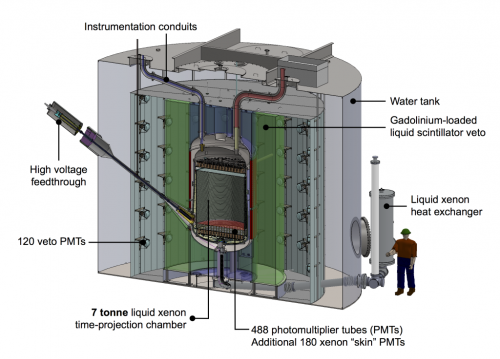 3D rendering of the LZ detector. Physicists believe dark matter could be made of difficult-to-detect particles called Weakly Interacting Massive Particles or WIMPs, which usually pass through ordinary matter without leaving a trace. The current LUX experiment consists of a one-third ton liquid xenon detector that sits deep underground where it is shielded from cosmic rays and poised to find WIMPs. When one of these particles passes through the xenon detector, it should occasionally produce an observable flash of light. "When completed, the LZ experiment will be the world's most sensitive experiment for WIMPs over a large range of WIMP masses," says Harry Nelson, physicist at the University of California, Santa Barbara and current spokesperson of the LZ Collaboration. The international LZ collaboration includes scientists and engineers from 29 institutions in the United States, Portugal, Russia and the United Kingdom. The next-generation detector, LZ, will consist of a 7-ton liquid xenon target and an active system for suppressing the rate of non-WIMP signals known as background events, both located inside the same water – tank shield used by LUX. This significant increase in detection capability will increase the sensitivity to WIMPs by more than a hundred times. Another DOE- and NSF-approved project called SuperCDMS-SNOLAB will also be looking for WIMPs, but with a focus on those that are lighter and less energetic than those primarily detectable by the LZ detector. A third project called ADMX-Gen2 is tuned specifically for axions, and will watch for them by monitoring signals stimulated by a strong magnetic field. "By picking a combination of these WIMP detection techniques that balance the potential sensitivity, the technical readiness, and the cost, the idea is to have the broadest dark-matter detection program possible," says Murdock "Gil" Gilchriese, LZ project scientist and physicist in Berkeley Lab's Physics Division. "This is great news in the hunt for dark matter," says Kevin Lesko, senior physicist with LUX/LZ, SURF operations manager and from Berkeley Lab's Physics Division. "With our new detector at SURF, we plan on getting the experiment up and running by 2018 and will continue searching with LUX in the interim."